Workplace injuries, especially ones that causes lost wages, can be devastating to the working families of South Carolina. It is a scary proposition to face — not only are you dealing with pain every day, you are also worried about where and when is the next paycheck going to come from and who is going to pay your medical bills, mortgage and food for your family. But you do not have to worry. Having the right workers’ compensation lawyers on your side fighting for the benefits you deserve will go a long way in keeping you and your family financially secure. The Charleston workers’ compensation lawyers at Steinberg Law Firm have handled thousands of workers’ compensation cases. Let us use our experience to help you through this troubling time. Some employers are unhappy when employees are injured on the job. They do not want their workers’ compensation insurance premiums to go up, which can happen if there are a lot of work injuries. Often, employers will try to convince injured workers to not report the injury. These unscrupulous practices are against South Carolina’s workers’ compensation laws. Once you file a worker's compensation claim, these employers and their insurance companies will have a team of adjusters, lawyers and private investigators working to pay you as little money as possible, or to not pay you at all. But you can fight back. Having the right workers’ compensation lawyers on your side, fighting for your rights and the benefits you deserve will go a long way in keeping you and your family safe and financially secure. The Charleston workers’ compensation lawyers at Steinberg Law Firm have handled thousands of workers’ compensation cases. Let us use our experience to help you through this troubling time. Some employers are unhappy when employees like you get injured on the job. They do not want their workers’ compensation insurance premiums to go up, which happens from time to time when there are a lot of work injuries. 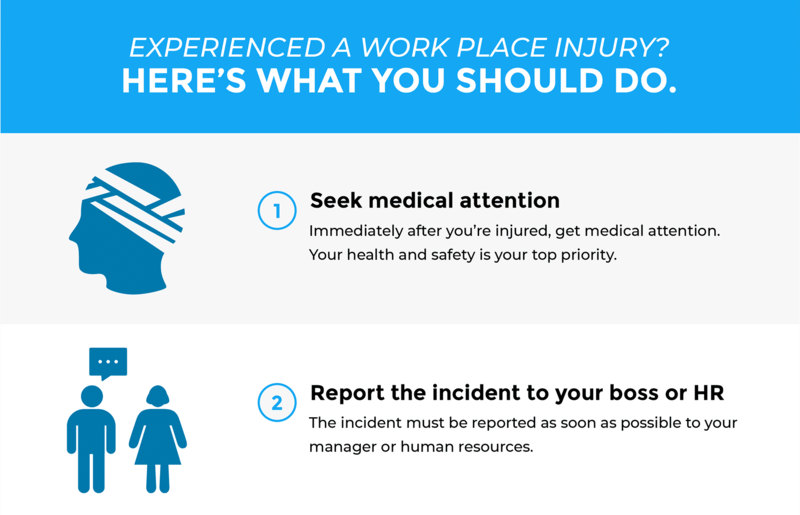 Often, employers will try to convince injured workers to not report the injury. These unscrupulous practices are against South Carolina’s workers’ compensation laws. You should have a team of highly trained, highly skilled South Carolina workers’ compensation lawyers on your side. The attorneys and staff at the Steinberg Law Firm will aggressively represent you all the way from the initial phone call to investigating the accident and making sure you are paid the benefits that you deserve. $1,000,000 in a claim for overtime and unpaid wages. Workers' compensation is a system of legally defined benefits available to most workers who are injured or become sick on the job. There is no downside to having your questions answered. The initial consultation is free. 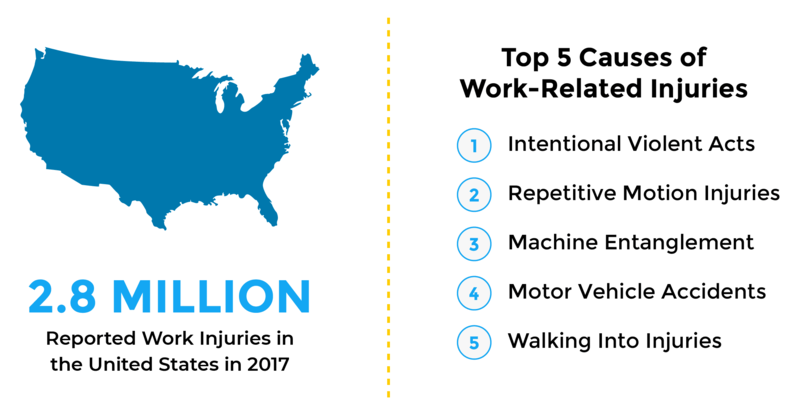 The top cause of injury at work is intentional violent acts. Injuries caused by repetitive tasks or accidents are secondary. 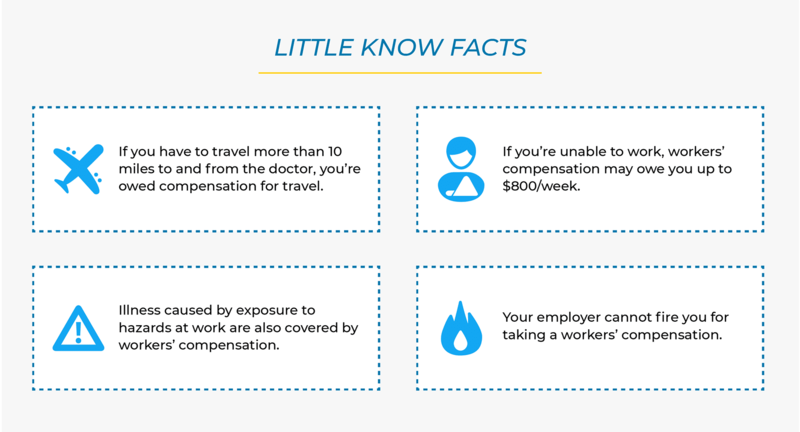 What types of benefits are you owed and how much? Unfortunately, even though the workers’ compensation system in South Carolina was initially designed to be easy to use and benefits were supposed to be easily obtained, far too many workers are unfairly denied the workers’ compensation benefits they desperately need. In these circumstances, legal action can help workers gain access to the benefits to which they are entitled. In South Carolina, two major criteria are used to determine compensation: whether your disability is temporary or permanent, and whether it is partial or total. This determination could make a big difference in what you receive. When calculating the amount of benefits you will receive on a weekly basis, the Judge looks at your gross average weekly wage. In most cases, an injured worker will receive two-thirds of their gross average weekly wage every week that the work injury causes them to be off work. There are a few exceptions to this general rule. If your average weekly wage is $75/week or less, then you will receive 100 percent of your wages each week that you are off. The other exception involves the state of South Carolina, every year, setting the top limit of average weekly wage that a worker can receive, no matter how much money they make in the average week. Therefore, if you are a highly paid worker and you are hurt, your weekly wage benefit will be lowered to the state mandated average weekly wage. If you are injured on the job, always seek medical care, even if you do not believe the injury to be serious. There are steps you can take to protect yourself. If your injuries are so severe that you cannot work at all, even on a light duty basis, then you can receive total disability benefits which is two-thirds of your average weekly wage. This benefit has a maximum of up to 500 weeks (approximately 9.6 years), assuming that your total disability is permanent. There is an exception to this rule, however. If your injury has caused you to suffer from brain damage or has left you a paraplegic or quadriplegic, there is no time limit and you will receive total disability benefits for the rest of your life. This benefit has a maximum of up to 500 weeks, unless you to suffered brain damage, or are paraplegic or quadriplegic. This category of wage benefits is dictated by whether the partial disability is temporary or permanent. If your partial disability is of a temporary nature, then you can receive weekly wage benefits of two-thirds of your average weekly wage for a maximum of 340 weeks (approximately 6.5 years). If your injuries recover and you can return back to work without restrictions, then your weekly benefits will stop as soon as you return to work. If you injury is not permanent, you are eligible to receive benefits of two-thirds of your average weekly wage for a maximum of 340 weeks. 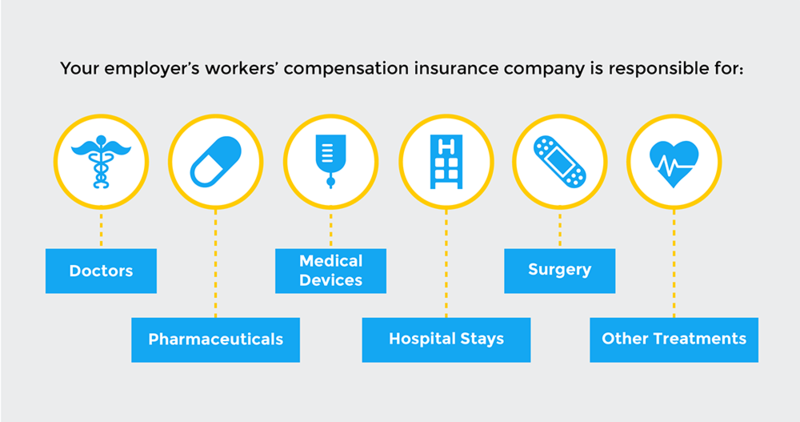 To learn more about workers' compensation in South Carolina, view or download our workers' compensation infographic. Other people can also qualify as total or partial dependents, but only if they actually depended on the worker for financial support at least three months prior to the work accident. Death benefits are paid for a maximum of 500 weeks from the date of the injury. Benefits for children end when they reach 18, or if they are enrolled in school full time, when they reach age 23. However, children who are physically or mentally incapable of self-support will continue to receive benefits for the full 500 weeks. Further, the workers’ compensation insurance company will have to pay up to $12,000 for funeral and burial expenses. There is a limitation to the payment of death benefits, however. The death must happen within two years of the work-related incident, or, if the worker has a continuing total disability, within six years of the work-related incident. Death benefits are calculated similarly to other types of benefits — two-thirds of the deceased workers’ average weekly wage (but capped by the state’s maximum average weekly wage which changes every year). If there are whole dependents, they share the weekly benefit. However, if there is a spouse and two or more children, the spouse will receive at least 50 percent, and the children will share the remaining 50 percent. If there are no whole dependents, partial dependents will receive benefits in proportion to how much they relied on the worker’s earnings. If any of the benefit is left over, it will go to the worker’s nondependent children, or if there are none, to the worker’s nondependent parents. If there are no whole or partial dependents, the worker’s nondependent children will receive the benefit. If there are no dependents or nondependent children, the worker’s nondependent parents receive the benefit.